Stave churches were built in Scandinavia and Northwestern Europe from the waning years of the Viking Age in Scandinavia (11th - 12th century CE) to the beginning of the Early Modern Period (1500 CE). The technique of using vertical posts - or staves - to construct massive wooden buildings had been modified over time through several artistic and architectural waves and eventually became a true European art form. The church in Moorhead is a full-scale replica of the Hopperstad Church located in the town of Vik, Norway. A closeup of the Hopperstad roof peaks and weather vane. The weather vane has since been moved inside for display (HCSCC photo). Built between 1996 and 2001, the Hopperstad Stave Church Replica in Moorhead, Minnesota, stands as a testament to Norwegian culture and heritage in the Midwest. It serves as an educational tool in the local community and is operated by Clay County’s Historical and Cultural Society. Conversion to Christianity in Norway occurred by royal decree at the end of the Viking Age. Despite the declaration, many Norwegians still practiced their traditional pagan religion, which had not required structures of worship but did recognize sacred sites. Those same sites were used to build new Christian churches that blended together old and new, pagan and Christian, in a unique style. Scandinavian stave churches were built during the twelfth and thirteenth centuries. The name comes from the support pillars (staves) in their interiors. 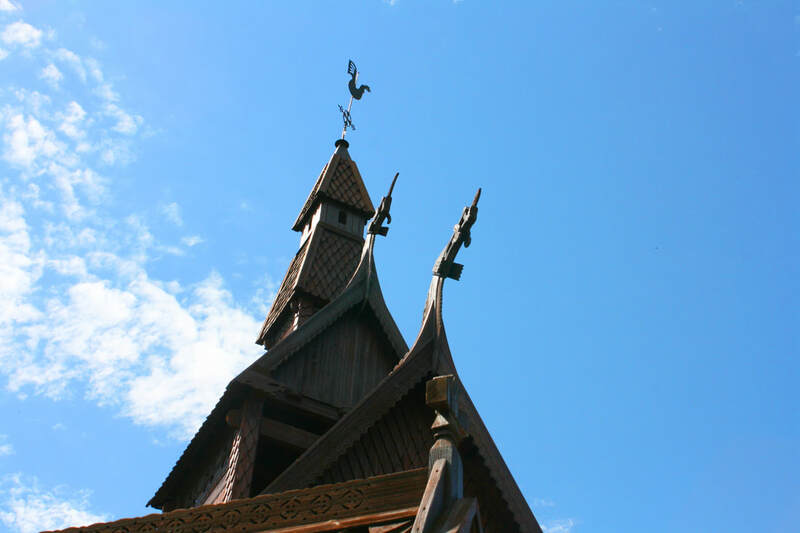 Structurally, stave churches combine a Catholic, medieval, basilica-style church and a traditional Scandinavian log building. Stylistically, dragons—pagan guards against evil—have their place next to religious art and crucifixes. Between 900 and 1000 stave churches were built in Norway. As of 2017, twenty-eight stave churches remain in Norway. One of these is the Hopperstad Stave Church, which for nearly 900 years has stood on the outskirts of Vik. It was this church that Guy Paulson chose to replicate in the 1990s. Gaylord “Guy” Paulson was born on June 23, 1937, in Haakon County, South Dakota, to Evelyn and Kristian Paulson. His paternal grandfather, Jens Paulson, emigrated from Norway with his family in 1904. The family made their living as farmers and practiced their Lutheran faith on the South Dakota prairie. Paulson married Beva Hill in 1960 and worked as a research scientist for the U.S. Department of Agriculture, based in Fargo, North Dakota. When Paulson retired in the mid-1990s, he went looking for a project. Years earlier, Paulson had seen a replica stave church in his native South Dakota. The church inspired him, and an idea began to take shape—one that would use his twenty-plus years of woodcarving experience and pay homage to his heritage as the son of Norwegian immigrants. He would build his own replica. Paulson and Beva agreed that this was a way that they could give back to the Fargo-Moorhead community. Paulson was not alone in his dream to build the church. Beva, his siblings, and other family members helped at all points during construction. Family friend Dale Ruff, an architect in Moorhead, donated the time of his architecture firm. Don Guida of Straight River Log Homes in Park Rapids agreed to build the main structure. The team took several trips to Norway to study the original building and look at plans and drawings made during its restoration in the 1880s. It was decided in June of 1996 that the church would have a home at the Hjemkomst Center in Moorhead. The Center was already the home of the Hjemkomst Viking ship replica, which had sailed to Norway in 1982 and partially inspired the church project. After the decision, Paulson began the ornate carvings that would decorate the interior and exterior of the church, and pine trees were cut for materials. Construction on the main structure began in August 1997, with the first two staves being placed in October of that year. The replica was built on-site and dedicated in 1998 when it was nearly complete. Visitors from Vik came for the ceremony bearing gifts. The replica was given to the City of Moorhead as a gift. The church was far from complete, however; Paulson took another three years to complete the ornamental carvings. In total, five and a half years went into the construction of the Hopperstad Stave Church Replica. At seventy-two feet in height, the church is a full-scale replica of the original. There are eighteen staves, each standing twenty-seven feet tall. The main structure is made of pine from Minnesota, with the portal carving done in redwood; 24,000 Michigan cedar shingles adorn its roof. While modern construction methods and tools were used, Paulson did all the carvings by hand. Since its dedication, the replica has been used for tours, weddings, and other community events. Owned by the City of Moorhead, the Hopperstad Stave Church is interpreted by the Historical and Cultural Society of Clay County. As written by HCSCC intern and volunteer Kaci Johnson for MNopedia (April 12, 2017).